A projected $20 million in revenue from a new city sales tax dedicated to relocate the North Little Rock Police and Courts Building isn't going to cover the new building's price tag, Mayor Joe Smith said recently, citing a rise in costs and competition in the construction industry. "We think the Police Department is going to cost $30 million now rather than $20 million," Smith said during a pair of interviews. "We have to go get that additional $10 million and have to borrow it, or take it out of our fund balance [reserves] that I don't want to do." Smith said his plan is to seek a bond issue of about $16 million that would include two additional projects he has been considering: $3 million in improvements at the North Little Rock Municipal Airport and up to $3 million to build three cabins on a ridge overlooking the Burns Park Golf Course. He will ask the City Council next month, he said, for approval to move forward with hiring architects, a bond underwriter and bond counsel to begin the formal process. "There's a lot to be done before we have serious discussions about it," city Finance Director Karen Scott said in a separate interview. "The council would have to authorize going forward. It would be several months in the making. "The earliest we could pull the trigger would be the first quarter of 2019," she said. "It would then be months before any debt service would be due." North Little Rock voters approved the 1 percent city sales tax in August 2017. The tax was split between a permanent one-half percent for city operations, and a five-year, one-half percent for capital improvement projects. The tax is estimated to raise $40 million in its five years. Those projects were estimated at $20 million for the new police and courts building, $10 million for streets and drainage repairs, and $10 million for fire station renovations. The new police and courts building will be built in the 2600 and 2700 blocks of Poplar Street, where the Arkansas Army National Guard's Fisher Armory and the North Little Rock School District Administration Building are now. All parties have agreed on transactions involving a land exchange and $500,000 payment by the city to acquire the sites. "When we got the architects on board for the police and courts building, we realized it was going to come $10 million over what we have allotted from the half-penny [tax]," Smith said, adding that some of the building's size has already been reduced. "Can I save $1 million a year for four years? I can, but we'd still be short, and I'd like to have that money in the fund balance." The construction overrun for the police and courts building opened the way for making two revenue-enhancing improvements -- at the city's airport and its largest public park, projects Smith said he has been considering for a while. "We know we need the money for the Police Department," Smith said of the planned bond issue. "We won't need any of the money until this time next year, but we have to know if the council will let me do it. I want to catch the construction season this summer for the cabins and the airport." The North Little Rock Municipal Airport, 8200 Remount Road, would use the money to make improvements, expand its amenities and replace some 40-year-old buildings, things that would help corporations in the city make a better impression on clients they bring in, said airport General Manager Clay Rogers. "The facilities for those corporate clients, they're really bad, really old," Rogers said. "When they're bringing in clients and flying in, the airfield looks great and the runways and lights and everything look great because we've been getting state grants over the last 10 years for those. But the facilities, as far as the building and the operations for that, are really lagging behind. They were never really built to handle that kind of business in the first place." Smith said the airport hangars "are full now." "Corporate North Little Rock enjoys having a North Little Rock airport here, but we have to upgrade the facilities for our current corporate jets and for future corporate jets or airplanes," Smith said. "There's not any room for one more company out there." Rogers said improvements would be for a new fixed-base-operations building and a new corporate hangar that would allow up to four smaller corporate jets and a separate restaurant building. The airport could also demolish two sets of "T-hangars" for smaller aircraft and build new hangars. "We will be seeking [state aeronautics] grant money for as much of this as we're able, too," Rogers said, which could reduce the amount needed from the bonds. "We've had this plan for a while. It's just been a matter of all the pieces coming together at the same time as far as funding goes." 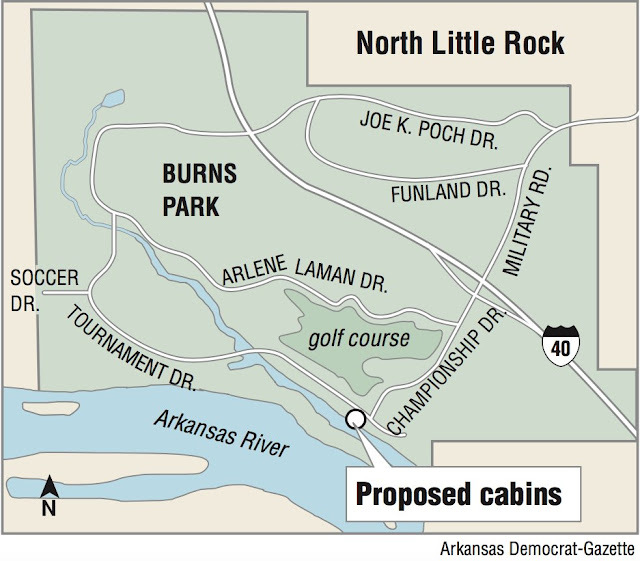 The idea to place cabins in Burns Park is something Smith said he had previously discussed with Parks Director Terry Hartwick as an addition to help accommodate people in the dozens of soccer, baseball, tennis and golf tournaments the park hosts every year. Smith's vision, he said, is for three rustic-styled cabins similar to what's available at Mount Magazine State Park in Paris, with two- or three-bedroom designs and a wraparound porch with a view of the Arkansas River from the back and the Burns Park Golf Course from the front. The spot Smith said he's picked out is on a slight hill just west of Championship Drive and Tournament Drive. Hartwick said clearing away some brush, but leaving the big trees, will allow a scenic view up and down the Arkansas River. Utilities would have to be extended to the site, with underground electric lines instead of overhead lines so as not to obscure the views, Hartwick said. "We see it as an addition to the park as an all-purpose park," Hartwick said. "We have a million people come through Burns Park in a year. And some are not staying in our hotels. We'd rather have some of them be in a cabin here where they can look onto the golf course or the river. "We think we can keep them booked year-round, especially with all the soccer tournaments we have," he said. "Some weekends we'll have 10,000 to 15,000 people here from all over. They're always looking for places to stay." The bond issue would be backed by the city's franchise fees collected from utilities and cable companies, Scott said. The 2018 general fund budget has $3.65 million budgeted from franchise fee revenue. "Those two things will be revenue generators at some point and time," Scott said of the airport improvements and the Burns Park cabins. "These projects would be investments."